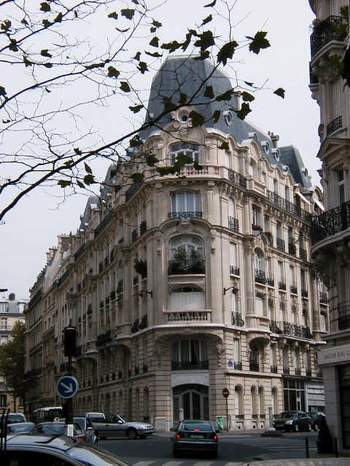 A Haussmannian building in the 7th arrondissement. Notice the leaves missing on the tree in the foreground. Drought does this. Now government officials are saying that the death toll in France related to the heat wave will probably be 5,000. Official numbers will be available in a few weeks. While the emergency rooms have returned to normal, the funeral homes are still backed up. Their backlog will last for a month and a half. The Director General of Health, Professor Lucien Abenhaim, has resigned, but says he is just a scapegoat. Lots of people in the government are to blame for this tragedy, it seems. However, one thing is clear to me: Météo France announced the heat wave on August 1 and said it would be long in duration. That was warning enough. The government simply didn't react until it was too late. In Detroit, when there is a heat wave, old people are moved to "cooling centers." I like that idea. The mayor of Paris, Bertrand Delanoë, paid a visit to a city-owned retirement home (there are 13 of them!) where the staff was particularly successful in preventing heat-related deaths. Only one of their residents went to the hospital, and only one died (maybe the same person?). Le Parisien referred to the teams at this retirement home as people who were accustomed to high temperatures (people from North Africa???). They worked hard, going around to be sure each resident drank water every 30 minutes. They gave intravenous or subcutaneous fluids often. They spritzed the residents with water. They did everything possible. They worked three times harder than normal. Not one room in the retirement home is air conditioned. Flame near Pont d'Alma. Princess Di's life ended in a tunnel under this spot. 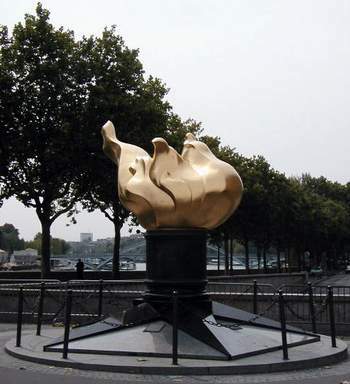 The flame is supposed to be like the one on the Statue of Liberty, but has come to be a memorial to Diana instead. As I mentioned, Tom and I suffered physically from this "canicule," too. One day we just felt that we had to go out walking, as we normally do. We were in the neighborhood of this monument (at left) when I started to feel very strange. I had been drinking plenty of water, so I don't think it was dehydration. I think it was just an elevated body temperature. I felt like my head was bobbing and floating above my shoulders. I felt downright strange and sick. I needed to find a restroom. We walked all the way up to the Champs Élysées along the fashionable avenue Montaigne and found a nice terrasse, Le Petit Élysée, at 49 avenue Franklin Roosevelt (phone 43-59-91-06). We sat in the shade and I had an excellent salad with goat cheese (the cheese, on slices of French bread, had been expertly broiled with spices on top); Tom had ice cream. I used their facilities. We drank more water. And then I felt better. But it was scary. I later learned that it was 102 degrees F that afternoon in Paris. And that is in the shade. Two days later, Tom had a bad day. I think I already told you about that. These two experiences have told us that when we get much older, it probably won't be a good idea for us to spend summers here in Paris. The hospitals cut back on their staffing and services so much in July and August (at the command of the government, I believe), that I don't think it would be a safe place for older people to be. Heaven forbid that you need to go to the hospital in the summer, especially during a heat wave. Maybe things will change, and maybe we'll then change our minds. But for now, all is well. The weather is back to normal. We take our walks. We read a lot. We go out to eat in the evening. 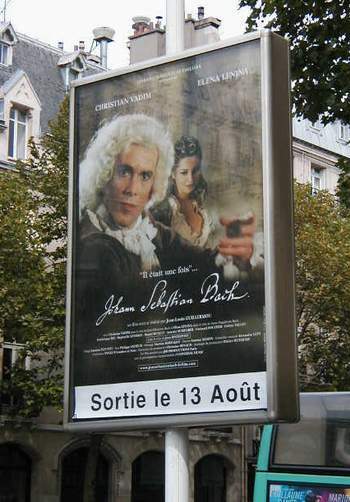 The "intermittents" disrupted the opening of this movie on the 12th. See August 13. This being the middle of August, our choices of restaurants are slimmer. But we do just fine. After today, some of our old haunts will start to re-open. But we're only here for another week. Le Tipaza and Della Piazza remain reliable standbys, open all year, open every day. L'Antre Amis is also open all summer, but they are closed on Saturday (!) and Sunday. Le Bistrot du Septieme is open all the time, but last time we went there, the tall waiter tried that scam where they pressure you to leave a tip because you're American and they think you don't know that the tip is already included in the price. The waiter tried three or four times to get me to indicate that it was okay to punch a higher amount into the credit card machine, to include a tip, but each time, I politely said (in French), "I understand. 63 euros." 63 euros was the total bill for three people (my cousin Geoff was with us). Then the tall waiter had the gall to leave the change tray in front of me, on the table, after he took the signed receipt and credit card machine away. I turned it upside down before we left, just to make it clear that I understood perfectly well what he was trying to do. I can't believe he doesn't recognize us by now. Just about everywhere we go on a regular basis, the proprietors and servers recognize us and greet us warmly. I think this tall waiter has some kind of problem. He looks tense and worried all the time. I'm sure the owners don't know he's trying this scam on Americans. But the Bistrot due Septieme is such a good deal, the food is good, and it is there for you in August, so I won't take it off my "list." Just beware of the tall waiter's scams. I noticed on the internet that other Americans have had some problem with service there, too. Statues at the door of an embassy for a tiny Polynesian country. My cousin will be back in Paris this evening and we'll have another dining adventure with him. My older brother and new sister-in-law were just here for their honeymoon. It was fun taking them to several of the restaurants we have found recently. One of our finds from this year, Le Boudoir on rue Frémicourt, has already disappeared! Such a shame. I went by there this morning on my walk, to see if they might be re-opening soon, and voila! All the tables and chairs and the bar were gone. The place is being renovated and opened on September 15. No doubt it will not be Le Boudoir anymore. I just hope it is a French resto, and not yet another Italian place. Strange news includes an item about 3 boats of French tuna fishermen who were attacked by 30 Spanish fishing boats in French waters. The Spaniards ruined the French fishing equipment. But after the Spaniards departed, the French hauled out an extra set of equipment. The government responded by sending out one marine patrol boat which is ready to intervene. The French electric company, EDF, had been worried about blackouts this week due to increased demand for electricity caused by the "rentrée," that time of year when people return from vacation. The call to "civisme" (civic duty), asking the French to conserve, evidently worked. I know I did a couple things suggested in the paper, such as taking the TV off standby, leaving it in the completely off position. Anyway, it worked. Consumption is down. The only blackouts now are local ones in Paris, caused by the heatwave warming up the earth so much that the subterranean electrical network is malfunctioning here and there. Next to the Jacquemart Andre museum at 61, boulevard Haussmann, an enormous old mansion (hôtel particulier) is being converted to luxury offices/apartments. Another aspect of the rentrée each year is the simultaneous publication of lots of new books. This rentrée includes nearly 700 new novels! One that was prominently featured in Le Parisien is called Windows on the World. Written by Frédéric Beigbeder, it is a fictional account of a father who was having breakfast with his two sons in the restaurant on top of the World Trade Center on September 11, 2001. In spite of its English title, this book is indeed written in French. It sounds interesting. I might buy it. When the interviewer asked the author "What are the lessons to be learned from the attacks of September 11?" the author replied, "The central thesis of this book is that after the communist utopia died in 1989, the capitalist utopia died on September 11, 2001. So, one looks for new directions. Why not replace the United Nations with a global democracy? It is a compelling dream, the idea that 6 billion individuals elect a government that regulates ecological problems and intervenes in cases of genocide. The role of America is not to govern the planet; the planet must govern itself. Good, now, it is a dream that I won't live in my lifetime." Every week, the paper gives an account of the top selling CDs. Every week, it seems, Norah Jones is number one in France. Am I correct in thinking this is Ravi Shankar's daughter? I haven't heard the album, only little pieces of it used on TV commercials here in Paris. 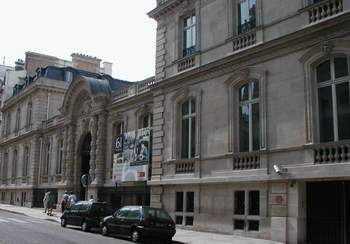 The Department of the Interior (presided over by the popular Nicolas Sarkozy) is peculiarly situated in the middle of a large city block. It is huge, but is masked on four sides by ordinary commercial/residential buildings. 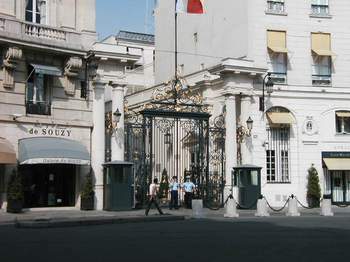 You can see it in two places: a facade along the rue Cambacérès, and here (at left), a gate on the Place Beauvau, directly across from Chirac's haunt, the Élysée Palace. The Department of the Interior is responsible for security, among other things, and I find it amusing that it is concealed so well. 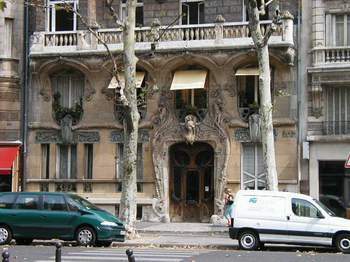 A fabulous Art Nouveau façade on avenue Rapp in the 7th arrondissement. Someone who is not so popular today is Jean-Pierre Raffarin, the prime minister. The way he's handled the aftermath and consequences of the heat wave, he appears to be uncaring and disconnected with the French people. Isn't that what felled the first George Bush?